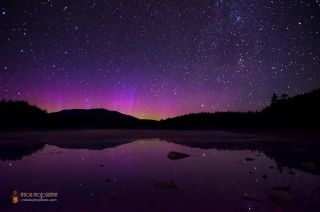 Mike Taylor sent SPACE.com this image of the northern lights surrounding Mt. Katahdin, Maine. He used a Nikon D7000 camera, Tokina 11-16mm at 11mm, f/2.8, 25 seconds, ISO 3200 on July 13, 2013 to capture the image. The processing was done with Lightroom 4 and Photoshop CS5. The northern lights envelop Maine’s highest mountain in purple and magenta and reflect off a nearby pond in this beautiful night sky photo. Mike Taylor captured this image about six miles south of Mt. Katahdin on July 13, 2013. He used a Nikon D7000 camera, Tokina 11-16mm at 11mm, f/2.8, 25 seconds, ISO 3200 to take the image. The processing was done with Lightroom 4 and Photoshop CS5. "I photographed time lapses at this amazing location for just over four hours on Saturday morning, observing the aurora borealis, the north end of the Milky Way and the stars and constellations moving through the night sky and reflecting in the pond," Taylor told SPACE.com via email. Auroras are caused by charged particles from the sun’s solar wind that shoot through the Earth’s atmosphere. The varied colors of an aurora are determined by the interaction of the charged particles with gases in Earth’s atmosphere. Earth’s magnetic field draws these particles toward either the north or south pole, causing the aurora borealis, or northern lights, and the aurora australis, or southern lights.